Keith Giffen is always a reliable writer. You know you are in for a lot of fun, sarcastic dialogue and great character interaction. 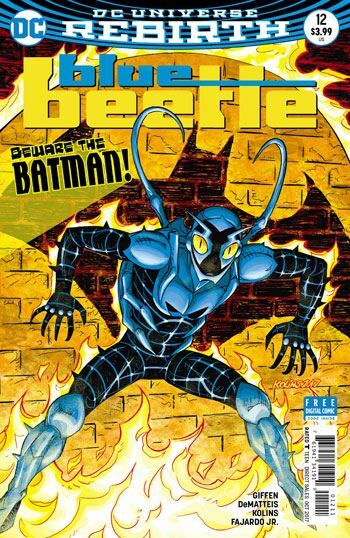 His run on this incarnation of the Blue Beetle series has been packed with guest stars. This issue is no different, as Batman comes to El Paso, and the finale sets up more guest stars as well. 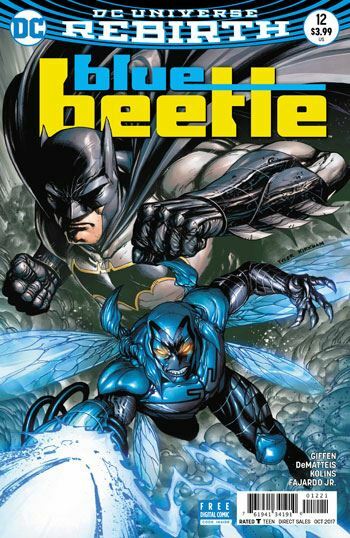 Batman pays a visit to Ted Kord, informing him that he intends to observe Jaime Reyes in action, to determine whether the boy should be allowed to operate as Blue Beetle. The conversation with Kord sets the story off in an entertaining vein, and also clarifies the relationship between Kord and the Justice League. There is some well set up miscommunication between Kord and Reyes, a very Giffen-esque villain, Ghostfire, providing the menace, and just enough chaos to make it a fun package all around. As always, I really enjoy Scott Kolins’ art on this book. His characters are given strong and distinctive looks, expressive and just a touch over the top. A perfect match for the way Giffen writes. And while it remains a super hero book, the stories always remain nicely grounded in the everyday life of a teenage hero. There is just enough pathos for characters to remain sympathetic. It’s actually quite the achievement to balance the humour, realism and touching moments. No wonder Batman winds up impressed.